'My insurer rejected my claim for a brain tumour': So Legal & General, what's stopping you paying up this time? When Ruth Dunn took the advice of her GP and went for a neurological check-up following a period of light headedness, pins and needles and dropping a cup of coffee, she thought she was doing the right thing. ‘Better to be safe than sorry,’ she kept thinking at the time. The fact that she had generous private medical insurance through her employer made the decision an easy one – the tests could be done quickly and they would not cost her a penny. When she saw the neurologist, he suggested that at best she was suffering from a virus. At worst, it could be multiple sclerosis although it was unlikely. Although the subsequent investigations – including an MRI scan, a lumbar puncture and an EEG – confirmed that there was nothing seriously wrong with Ruth, she now rues the day in 2009 she decided to heed her GP’s advice. This is because her failure to disclose these tests on an application form she completed for £125,000 of combined critical illness and life cover in 2012 – when she became self-employed – means that a claim she made for a brain tumour last year has been dismissed by her insurer Legal & General. Ruth’s case bears remarkable similarities to that of Mark Cannon, who we reported on three years ago. After our intervention, Legal & General begrudgingly paid up £280,000. After trawling through Ruth’s medical records for five months and discovering the medical non-disclosure, Legal & General accused her of ‘careless misrepresentation’ and said it would never have insured her against critical illness had it known of the medical investigations she underwent in 2009. Rather than pay her the £125,000, it has returned the £2,068 of premiums she paid for the cover. But the neurologist who examined Ruth prior to her benign tumour being removed in early December last year in a four-and-a-half hour operation insists there is no connection whatsoever between her symptoms in 2009 and the diagnosis of a meningioma (brain tumour) in 2015. In other words, Legal & General is using her non-disclosure as a convenient excuse to unravel the cover she paid for on the nail every month for more than three years – and therefore not meet her claim. Dr Greene’s opinion has been backed up in writing by Ruth’s long-standing GP Pamela McGregor. Ruth, 35, runs a children’s clothes shop in Biggar, South Lanarkshire. 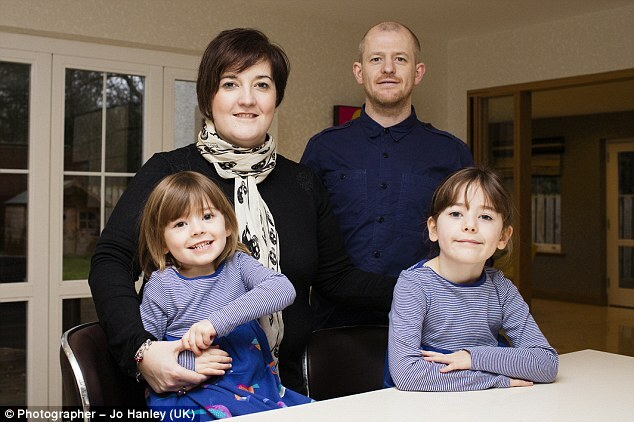 She has two children, four-year-old Zara and Rachel, seven, and is married to Gavin, a 35-year-old engineer. Still recovering from her ordeal, but confident of a full recovery, she is now angry with both herself – and Legal & General. Angry with herself for not revealing on her original application that she had the tests in 2009 – and with Legal & General for playing hardball. Ruth says: ‘I don’t know why I didn’t mention the scans in my application. I wasn’t hiding anything. On her dealings with Legal & General, she says: ‘I was admitted to hospital on April Fool’s Day last year with a blinding headache. Two scans on the same day confirmed that I had a brain tumour. ‘In June, I started my claim and was told that for it to be successful it was not good enough to just have the tumour. It had to be removed first or there had to be evidence that it had caused me permanent neurological deficit. Everything was sweetness and light until October when I was rushed into hospital following a seizure at home. I ended up spending five days in the hospital’s high dependency unit. Like Ruth, Mark Cannon is from South Lanarkshire and had bought financial protection insurance in 2007 to cover him and his family, in case he suffered a serious illness or died. When Mark was diagnosed with multiple sclerosis in early 2010, he assumed the £280,000 insurance would pay out. But Legal & General accused him of ‘negligent’ non-disclosure for failing to mention on his original application for cover that he had previously suffered blurred vision in his right eye, requiring his attendance at a hospital ophthalmology department. As with Ruth, his policy was unravelled by the insurer and his premiums returned. But Mark dug his heels in and took his complaint to the Financial Ombudsman Service which adjudicates on disputed claims. It backed his claim although it was only after our intervention that Legal & General grudgingly paid up. Ruth has spoken to Mark and has now also taken her case to the Ombudsman. Initially, it sided with Legal & General, but last week said it would reassess her complaint in light of the correspondence from both Dr Greene and Dr McGregor, confirming no link between Ruth’s 2009 illness and her tumour. This evidence had not been available when it made its initial decision. It has not seen the new evidence from Dr Greene or Dr McGregor. Last month, the insurer attracted criticism for refusing to meet a critical illness claim because the claimant, 44-year-old Hein Pretorius, from Tunbridge Wells in Kent, had only lost one leg as a result of a road accident. Hein’s policy only covered the loss of two limbs.